His Grace Brahmananda prabhu, one of the very first disciples of ISKCON’s Founder-Acharya A.C. Bhaktivedanta Swami Prabhupada, left his body in Vrindavan dham. Devotees of Lord Krishna consider it most auspicious to leave body in His holy abode, Sri Vrindavan dham. 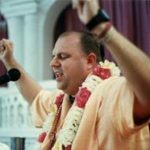 Reportedly, Sriman Brahmananda prabhu was requested to go to a Delhi hospital but he refused to do it as his desire was to leave his body in Vrindavan. All glories to Sriman Brahmananda prabhu. The following is a tribute that one of his godbrothers posted on dandavats.com. All glories to Brahmananda prabhu, who was one of a kind. There will never be another devotee exactly the same as Brahmananda. He was unique. 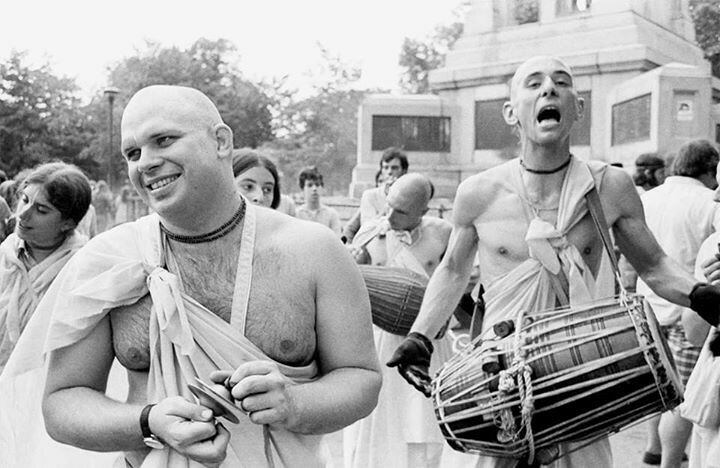 Even when I joined the movement in 1968, when there were only about 150 or so disciples of Srila Prabhupada world-wide, Brahmananda was already an icon in the fledgling ISKCON, which was destined to grow into the mighty movement that it is today. Estimates are that there are between six and seven million followers of ISKCON today, counting those who come only for taking Prasad from time to time, coming only for big festivals, Rathayatras, etc, or just dropping in to a temple occasionally, the proverbial “fringies”. Brahmananda was a great general in Srila Prabhupada’s ever-growing army. Newer devotees have heard about his fame, but don’t truly know what his historic contribution to the movement was, for they never saw him in action during his “golden years “as an active general”. He has been “retired” for decades now, but inwardly, inside, he has always remained a general in Srila Prabhupada’s army. His love for Srila Prabhupada is (present tense) almost unparalleled. Only fools and neophytes go by the externals by which they try to put a measuring stick to his love for Prabhupada by questioning “what did he do for Srila Prabhupada? I never saw him do anything for the movement”. Such offensive, misplaced thoughts should never be considered, for indeed, such persons never knew Brhamanda at all, so what right would they have to put a pathetic, mundane measuring stick to his relationship with Srila Prabhupada and his deep contribution to ISKCON? Brahmananda had a deep and complex personality—definitely not linear! If he was in a stern or angry mood, definitely you didn’t want to mess with him. In such moods he had a sharp tongue and could defeat almost anyone. Then there was the other side of Brahmananda—soft, loving, very friendly, affectionate, and a heart of gold. He was always kind and warm to me. One should not be fooled by his periodically demonstrated gruff exterior. He was also often jolly, and when he was in that kind of mood, everyone relished his association. Even if he was gruff, he acted in that way only out of his love for Srila Prabhupada. He was a transcendental fanatic that Srila Prabhupada should always be pleased by our activities. “This is what Srila Prabhupada wants; we must do it in this way!” He was completely, unconditionally surrendered to Srila Prabhupada during his most active years in the movement. When Srila Prabhupada ordered Brahmananda to go to Africa to preach, he didn’t hesitate. He pioneered the African preaching, opening the center in Nairobi. When Srila Prabhupada came to Africa for the first time, he inquired, “Where are the blacks?” Brahmananda replied that they had been preaching to the Indian community, but Srila Prabhupada was not satisfied with that answer. He said “It is their country” (indicating the blacks). They must be invited also; so without hesitation, Brahmananda began inviting some blacks to the temple. This is only one example of his surrender to Srila Prabhupada’s every order. Later, when he retired, he remained always loyal to Srila Prabhupada, his internal mood remaining the same. We should over-look his mistakes or errors in his retired years, for they are over-shadowed by his greatness, by his unswerving love for Srila Prabhupada. We should consider how Krishna engineered his departure, along with Srimati Radharani, (Vrindavanishwari), and Srila Prabhupada. The affectionate and concerned devotees were about to take him to a reputed hospital in Delhi, even to the point of already ordering the ambulance. However, before he could reach the ambulance, Srila Prabhupada came and took him to Goloka. Many decades ago, when very few disciples had yet left their bodies, to us foolish young people, death seamed far away. Yet at that time, Srila Prabhupada promised Brahmananda that “I will come and get you; do not worry”! So we see that certainly Srila Prabhupada made good on that promise, to the point of stopping the devotees’ ambulance plan. No one should have any doubts about this. Srila Prabhupada has come to take much lesser persons, so how he would not personally overrule the devotees by appearing suddenly and taking Brahmananda before he could be swept away from the Dham. To emphasize this point, and to encourage all of the followers of Srila Prabhupada, here are two narrations of Srila Prabhupada coming to take devotees into his eternal shelter. First, there was an initiated male devotee who had served many years in ISKCON, and like so many others, gradually he fell away. His devotee marriage failed, and he was out in the material world making a living at a non-devotee job. He married a non-devotee, and had children with her. 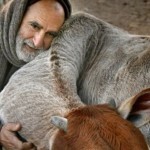 With the influence of unstoppable time, he naturally grew older, then falling ill with cancer. He was hospitalized in intensive care. It was clear he was going to die. 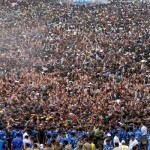 His wife, children, and non-devotee relatives all came to “see him off”. He was in a deep coma. Suddenly he opened his eyes wide, exclaiming “Srila Prabhupada!” and then he was gone. The non devotee relatives asked their daughter, “what was that all about?” They were both amazed and confused. She replied, “Oh, he used to be a Hare Krishna”. So we must see that Srila Prabhupada didn’t even care that the fallen disciple had drifted away. He only felt deep gratitude for his years of dedication in helping to build this movement when Srila Prabhupada needed the help the most. This is Prabhupada—always grateful, which is one of Krishna’s outstanding qualities as well. Brahmananda could be as soft as a puppy or as terrifying as Bhima. Once, probably in New York, a demon entered the temple. He was making his way towards Srila Prabhupada. It was evident that he may have had in mind to do some physical harm to Srila Prabhupada! In a calm, cool voice, Srila Prabhupada pointed at Brahmananda, saying, “He will kill you if I ask him to!” The demon backed away like a shamed dog with his tail between his legs. That was Brahmananda and a glimpse of his relationship with Srila Prabhupada. He would do whatever Srila Prabhupada asked, unconditionally. Brahmananda was a formidable personality. Even in the early days of the movement he had a “presence” like a watch dog, perhaps a German Shepherd or a Pit Bull, but he would keep this side of his personality checked much of the time. Still, you could feel the vibration. He was one of the sannyasis who formed a “stockade”—a wooden fort made of heavy upright logs bound together. The stockade was their dandas. It was quite intimidating. No one got through this fort to Srila Prabhupada without the blessings of the sannyasis in those days, at least in some circumstances. Even after I was a five year devotee, who was a little senior in those days because the movement was still so new—I was very intimidated by the sannyasi fort, as were many other devotees. Of course the key, upright, very powerful log in the fort was Brahmananda. In Los Angeles, even though I was semi-senior, I was afraid to enter Srila Prabhupada’s garden for darshan. I probably could have without any problem—other devotees with less seniority than me were there, but I was admittedly intimidated; so I peeked through a knot hole in the fence instead. In spite of this periodically manifest mood of intimidation, if Brahmananda smiled, it would melt your heart. He was a thoroughly good person, not matter what was his style of delivery. Brahmananda will go down in history as one of the foundational pillars in the founding of this movement. Unfortunately, only one book of his association with Srila Prabhupada has been published, that I am aware of, that chronicles the early days in New York. He probably had at least four more books in his heart of most relishable pastimes with Srila Prabhupada. Much of this can be restored by interviewing his beloved brother, Gargamuni Prabhu in Vrindavan, which should be done without delay! Time is of the essence! Our God Sister, Daivi Shakti in Vrindavan (c/o Krishna Balaram Mandir), must be fully supported by ISKCON in her efforts to preserve the Prabhupada remembrances by disciples, which have been recorded for many years in Vrindavan, but are languishing, growing mold in boxes. This should be rectified without delay. She told me she needs both financial assistance for the project and help cataloguing the recordings, some of them quite old now. If it is already in progress, then Jai! However, more support is required. 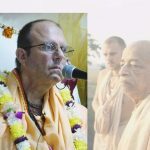 Every year now at least one or more Prabhupada disciple leaves their body, and a reality check reveals that the number per year will inevitably go up very soon! Please join in the effort to preserve Srila Prabhupada’s legacy. Perhaps there are sufficient recordings of Brahmananda that another book could be put together soon. Srila Prabhupada lives forever, and his followers live with him. Let us join in remembering Brahmananda with love, and upgrade our efforts to preserve the Prabhupada remembrances for all future generations.